Janie Devereaux could feel her blood pressure plummet as she stepped off the starboard side of the charter boat, A Shore Thing, onto to the sandy beach of Cat Island. Still, she was superstitious enough to make sure she stepped off right foot first. No point in accidentally stirring up any bad luck. Oh, and she couldn't forget the cookies! Janie loved, loved, loved the Cat Island cookies. The lime ones were her favorite, but she seriously loved them all. She knew when she checked into the Cat Island House, a complimentary bag of those delicious, buttery cookies would be waiting for her. Yep, weekends on Cat Island were sweet, just like those wonderful cookies. 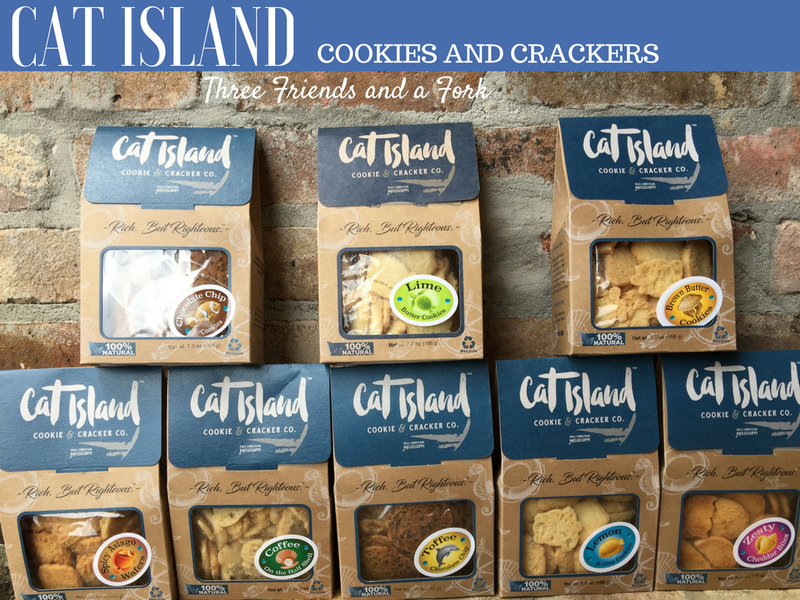 I recently received a box of Cat Island cookies and crackers to review. I was a little nervous, because another company had previously sent me a tin of cookies to review, and after tasting their cookies, I had to tell them I would be happy to write the review, but it would not be good because I hated the cookies. They never replied and I never wrote the review. I felt it was only fair to let them know what I really thought about the cookies, but I also did not want to write a bad review that would hurt their business. That's not my job. But if I can honestly enhance someone's business, well, I am happy to do that. So, along came Cat Island Cookie and Cracker Company. 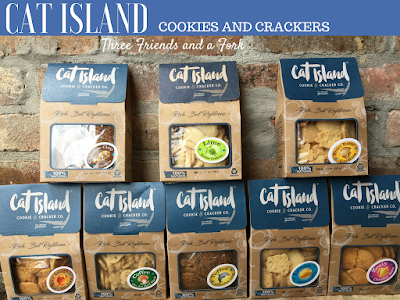 Cat Island cookies and crackers are a different story altogether. First of all, there's the name. Cat Island is such a great name, it made me want to write a novel about sweet life on a secluded island. That is what you see up above, the introduction to my imaginary novel. It turns out, there really is a Cat Island off the coast of Mississippi in the Gulf of Mexico. The tiny island has had a pretty difficult time because it is shrinking. First it was hit full on by the fury of Hurricane Katrina which completely eroded the shoreline and breached the island in several locations. Additionally, the dredging of the Gulfport ship channel has undermined the natural westward flow of sediment which helped combat erosion on the little t-shaped island.Then along came the BP oil spill. The erosion problem combined with oily vegetation was devastating to the island. Today, the state of Mississippi is working hard to restore the barrier island. The state now owns about 700 acres of the 2,000 acre island. Also, there is that great name, Cat Island. Turns out the name was given to the island by Spanish explorers who spied large numbers of raccoons on the island and thought they were cats. There were still lots of raccoons on the island, along with migratory birds and alligators until the devastating events mentioned above. Hopefully the state can restore the island and give the animals a reason to stay. But, enough history, back to the cookies. I opened up a large box and found eight bags filled with six different kinds of cookies: chocolate chip, toffee, lime, lemon, brown butter, coffee and two savory crackers: spicy asiago and zesty cheddar. I was feeling optimistic, the flavors sounded good. Checking the labels, I was happily surprised to find that I could read and recognize every single ingredient. Flour, real butter, sugar, eggs, lime, chocolate, lemon, aged asiago, real cheddar...these were all ingredients I would use if I were baking in my kitchen. One by one, I opened each bag and sampled the contents. First the savory crackers. The zesty cheddar crackers were both zesty and cheddary, with a crispy crunch. I liked them! The spicy asiago crisps were more bold and full of cheesy goodness. I was getting excited. So far, this was not the disaster I had encountered the first time I tried to review cookies. On to the sweet cookies. The lemon butter cookies were also outstanding and full of citrusy lemon flavor. Next up, the coffee flavored cookies, called Coffee on the Half Shell (I love that name), were sweet with a subtle coffee flavor. Sometimes coffee can be an overpowering flavor, but Cat Island hits just the right note. I felt if they could nail the coffee flavor, the rest of the cookies would be exceptional, too. The chocolate chip cookies were crispy and full of chocolate chips and, in a word, delicious. The toffee cookies were a bit more chewy and equally yummy. Finally, the brown butter cookies were everything you would want in a butter cookie and more. The browned butter gave them the flavor of a pecan sandie, without the nuts. Y'all, I cannot recommend these cookies enough. I consider myself to be a pretty accomplished baker, but why bother when you can buy these already made. I asked my husband which he liked the best and he said, "I keep trying them to see if I can find a bad one, but I can't." That is just his way of excusing himself for eating one entire bag at a time. As for you, you can order your own Cat Island goodness, by going to http://catislandcookies.com/. You will be glad you did, and who knows, you might start working on your own novel! Gotta get back to writing before I eat all my inspiration! Disclaimer: I was given the cookies by Cat Island in exchange for a review, but no demands were made as to the content of the review and all opinions are entirely my own.